Since the turn of the century, every American summer has seemed to produce one or two Caribbean-styled dance-pop hit sensations, and the summer of 2005 was no different, as the relentless dancehall-lite booming rhythms of Rihanna's Pon de Replay seemed as omnipresent as sunshine. Like Daddy Yankee (Gasolina) and Sean Paul (Get Busy) in summers prior, Rihanna emerged initially as an unknown superstar, known far more for her song than for herself. Unlike Daddy Yankee and Sean Paul, however, she is a woman – a young and beautiful green-eyed one, to be more specific. Pon de Replay caught fire almost immediately, challenging We Belong Together's half-summer reign atop the Billboard chart before Music Of The Sun even saw release. Rihanna benefits from the knowing production work of Syndicated Rhythm Productions, aka Evan Rogers and Carl Sturken, who together produced a laundry list of contemporary teen pop sensations during the prior decade. It's not too late for a summer getaway after all. With her debut album Music Of The Sun, new artist Rihanna brings us the sultry dancehall and R&B sounds of the Caribbean islands. The best songs on Music Of The Sun that follow the appealing template of Pon de Replay are Here I Go Again and If It's Lovin' That You Want. The uptempo vibes continue with the seductive R&B pop track Let Me. Here, the sweet songbird makes sure a certain boy recognizes her efforts on the dance floor. Later, Rihanna's R&B vocals are aptly paired with the unique sounds of rapper Kardinal Offishall, who is of Toronto/Jamaican heritage. The bass-heavy sound of the song alone would make a welcome addition to any DJs play selection at a club. Rihanna sheds an up-tempo style and demonstrates her ability to manipulate melody on You Don't Love Me (No, No, No). The track cleverly samples Dawn Penn's original classic of the same name. 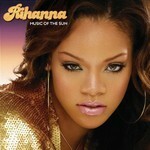 Rihanna breaks down the mid-tempo track by methodically crooning with an assist from reggae rapper Vybz Cartel. Listeners already in love with Pon de Replay will be pleased to hear the song's remix featuring dancehall igniter Elephant Man close out the album. Barbados-born seventeen-year-old Rihanna moved to America only two years ago, but she's already scored one of the biggest hits of the summer. Her powerful singing voice conjures up feelings and experiences way beyond her years....while still maintaining her youthful spirit. Besides ripping traditional reggae tracks like a seasoned dancehall queen, she exudes the kind of energy that solidifies her as one of 2005’s top emerging artists. It's no wonder that all it took was a quick audition with Shawn 'Jay-Z' Carter, President & CEO Def Jam Recordings, for the striking beauty to land a record deal. Music Of The Sun is Rihanna's appealing feel-good first outing that promises to deliver something for everyone...from the clubs to the Carribean, worldwide.